Samlesbury Hall is a grade II listed building, registered as a charitable trust, rich in history and one of the most haunted buildings in England. The Hall welcomes visitors and offers ghost investigation evenings. 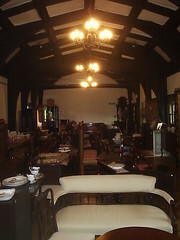 The Hall was build in 1325 and left independent ownership as late as 1925 when it gained its trust status. The first hall was destroyed by soldiers loyal to Robert the Bruce after the Battle of Bannockburn in 1314. At least one owner of the hall killed themselves. Joseph Harrison bought Samlesbury Hall in 1862, but spent too much money entertaining guests, got badly into the debt and shot himself in 1878. Before Joseph the hall’s owner, John Cooper, leased the building a boarding school for girls. Samlesbury Hall has been investigated by a number of professional ghost-hunters from the UK and abroad. In this video (1m44) the BBC narrates some of the more popular stories while the American ghost-hunters set up their equipment. 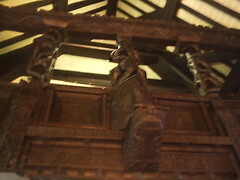 There have been many deaths at Samlesbury Hall in its 700 year history. Most Haunted (series five) investigated the hall. Derek Acorah was possessed by a spirit calling herself Dorothy. While possessed Acorah refers to ‘father’ and ‘the devil’. Samlesbury Hall is haunted by a white lady. The most common belief is that the white lady is Dorothy Southworth (or Dorothea Southworth), daughter of Sir John Southworth. She fell in love with the son of the neighbouring Protestant noble family. Despite the families refusing to let young lovers meet, they continued to do so in secret and planed to elope. However, on the night of the escape Dorothy’s brother killed the not only the young noble man but two of his accomplices. Dorothea is said to have gone insane before dying at a convent abroad. Three human skeletons were found hidden in the walls of Samlesbury Hall and this seems to add credence to the story. Historic records show that Sir John had no daughter called Dorothy. However, Sir Thomas Southworth did and she would have been Sir John’s sister. Another haunting is that of two ghostly figures. At times a woman is seen dragging a child behind her. This famous sighting has been successfully captured on camera phone. At about the 29 second interval of this 1m06 video a ghostly outline clearly passes the screen. Could these two be a woman and child who died at Samlesbury Hall? The Priest Room within the hall is said to be haunted by the angered spirit of a decapitated priest. Murdered during the reformation the priest’s blood still stains the floor where he fell. Joseph Harrison had the entire floor replaced but the blood still appears and is often photographed by visitors today. Haunted Heritage Tours may have a clear photograph of this ghost. Joseph Harrison himself haunts the hall. After killing himself in 1878 continues to remain in the building. The sounds of footsteps in the Long Gallery are said to belong to him. Harrison is also said to like woman with long hair and there have been reports from visitors with long hair of something unseen stroking or pulling their hair. A slightly less well known ghost story from the history of Samlesbury Hall is of a guest of the hall witnessing a six horse funeral carriage out on the drive. The dark driver of the hearse looked up and deep into the eyes of the guest. The driver, it seems, was missing many teeth and had a patch over one eye. The frightened guest returned to dinner only to discover that no one else had heard the sounds of the horse drawn hearse, or seen anything, even though it would have been right outside. A week later the same man was staying in a hotel in London. To his shock the lift doors opened to reveal the same one-eyed and toothless man wearing the uniform of a lift attendant. He panicked and fled from the lift. Seconds later and with a terrible crash the lift tore free of its cables and smashed into the ground floor taking the spooky attendant with it. The hotel manager confirmed later that there was no lift attendant employed by the hotel. The interesting thing about the story of the phantom hearse driver is how this apparition seems to represent death – first the hearse and then the crashed lift. Was the ghost trying to warn the guest? Was the guest simply sensitive and able to see the ghostly premonition? It is also interesting that this ghost may have followed the Samlesbury Hall guest out of the Hall and to another location. That’s not common and suggests an entity with a lot of power. Could it have been a demon? A geomantic analysis of Samlesbury Hall and its location suggests the area is a nexus of spirit power (some might say ley lines). Geomancy is the technique where the markings or thrown handfuls of soil on the ground can be analysed for significance. It is used from Africa, to Korea to Europe and by such teachings as the Hermetic Order of the Golden Dawn. Samlesbury Hill may be a good location to attempt contact with a powerful spiritual force – either through Ouija, voodoo doll or poppet. A poppet is a folk-magic and witchcraft instrument which represents a person and is used to cast a spell on that person. The common perception of voodoo dolls (technically known as vodou dolls) rose from the European tradition of poppets. The intent behind the poppet is to infuse magickal or spiritual energy into whomever the effigy represents. In Samlesbury this energy may then be used to assist in communication. Have you been to the Hall? Did you feel anything or see a dark phantom? great place to visit. didnt really find the place to have any energy or ghostly presence. TAPS team from the USA did an investigation Not long ago. they found no prove of any ghosts or energy. intetresting side note. my uncle was from billington. A buddy and himself were in a bad motorbike wreck outside the hall coming back from Preston Barracks. They both said the saw a white lady crossing the road and swereved to miss her. Does anyone know any information about a 9 year old girl who testified against the Pendle witches on August 18-19, 1612 and helped convict them? i've heard the legend of people swerving to avoid the white lady before. Hi Michelle, thanks for the comment. Don't know what happened to commentLuv on your comment but it was messy and ugly so I removed it. If you posted your YouTube URL then it's been gobbled up and you'll need to post it again! Sorry about that. We just recentley visited samlesbury Hall, and yes there is definitley a presence of spirits, we picked up on 4 inside the hall a lady to the top of the stairs a little girl a man counting money and a big bloke standing by the earth, when walking my pup Beagle with the ground, she was behaving very strange, she seemed frightened and stressed, and so we had to take her back to the car to calm her down, I would say there are definitley spirits in this area, it was a very strange experience. I would like to go to the hall how did you get to see it. It was built by my 9th Great Grand Father. I have personally been to Samlesbury Hall as a child on a school trip and for the most part it was great banter and a good experience but some people, including myself, felt something there. We were put into groups of around 6 and we were without a teacher and were left to look around. We all saw the lady in white and the ‘leader’ of the group dismissed it as a tour guide messing around, but then I was flicked in the back of the head and everyone else in the group was walking infront of me and it couldn’t have been any of them. I can’t remember perfectly what room it was but when we regrouped with the rest of the class, with tourguides, we went back in our groups and went up some stairs alone. We went into this room and it had blood on the floor and a hopefully fake dead body. Something whispered in the air and we were deadly silent, it was an adult voice too. We started screaming, some starting crying and the teachers and tourguides ran to see what was wrong, as no other group had done that. Once we explained what happened, the teachers said it was just our imaginations. Also, when we were walking into the hall at the start of the day I swear down there was a carriage with horses but there was no driver on there. So yeah, that was my paranormal experience at Samlesbury Hall. Bear in mind that I was in around Year 3 when this happened, and have done some research on the place later in life.